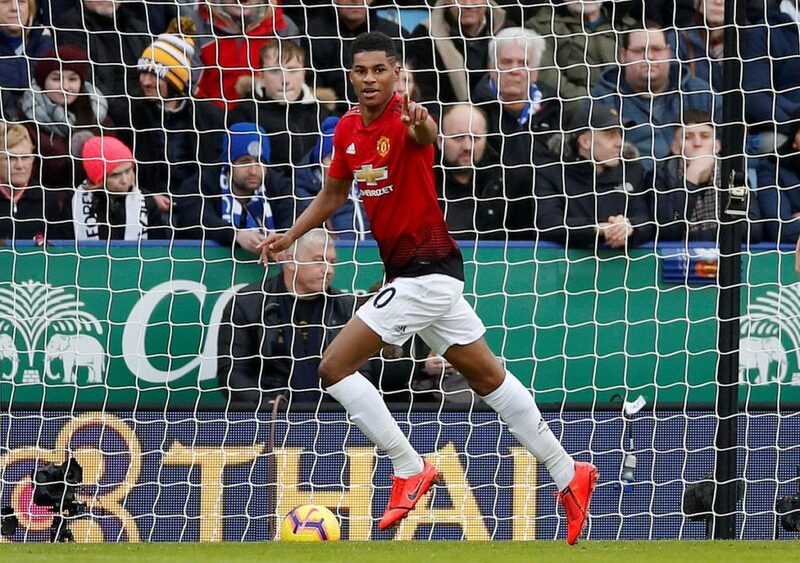 Marcus Rashford scored the game’s only goal inside the opening 10 minutes as Ole Gunnar Solskjaer made in nine wins from 10 as Manchester United caretaker manager. Leicester City forced a couple of good saves from David de Gea as we sat off in the second half. Today’s 1-0 win at the King Power Stadium has moved us back to within two points of Chelsea who currently occupy the final Champions League spot. David de Gea 8 – Comfortable save from Ricardo Pereira’s 20-yard effort in first-half stoppage time was the only time David de Gea was called into play in the opening 45 minutes. Excellent reactions to deny Jamie Vardy’s spectacular effort on the hour during a busier half for the Spaniard. Cracking save to deny Rachid Ghezzal’s direct free kick in the final 15 minutes. Ashley Young 5 – Made a number of important challenges as Leicester attacked down our right a lot but Leicester got in behind Ashley Young several times, mostly during the first half. Eric Bailly 8 – Threw his head in the way of a powerful effort to deny Demarai Gray in the first half. Got the better of Jamie Vardy and the the Leicester attack. Victor Lindelof 8 – Jamie Vardy didn’t see a clear cut chance in open play but David de Gea was a bit busier than he may have been expecting. Victor Lindelof showed some good positioning in defence. Luke Shaw 9 – Excellent last ditch block to deny James Maddison an excellent chance to equalise inside the opening quarter of an hour. Luke Shaw prevented Ricardo Pereira from causing any problems despite the Leicester full-back constantly pushing forward down the wing. Made a number of interceptions to prevent Demarai Gray getting in down the wing too. Nemanja Matic 8 – Collected a yellow card late in the first half to prevent Ricardo Pereira breaking away down our left. Nemanja Matic made a number of important tackles and interceptions inside our own half and around our own penalty area. Ander Herrera 8 – Another energetic, battling display from the Spaniard who was key in winning the ball back for us numerous times. Paul Pogba 8 – Missed a close-range header in the opening moments but pulled off a sublime assist for Marcus Rashford’s opener inside the first 10 minutes. Paul Pogba played some excellent passes but wasn’t a goal threat himself this afternoon. Jesse Lingard 7 – Picked up a yellow card on 20 minutes for accidentally tripping James Maddison on the counter. Excellent movement from our front three on the counter-attack ourselves but Jesse Lingard wasn’t greatly influential with the ball at his feet. Marcus Rashford 7 – Excellent first touch and finish to give us the lead on 9 minutes. After a lively start Marcus Rashford wasn’t hugely influential after and eventually replaced by Romelu Lukaku. Alexis Sanchez 5 – Looked lost at times out on the left wing even though he was up against a terrible defender in Ricardo Pereira. Dropped deep and central to get involved but never a threat on Kasper Schmeichel’s goal. Tidy on the ball at times. Replaced by Anthony Martial midway through the second half. Anthony Martial (24 mins) N/A – Important interception inside his own penalty area in the final 10 minutes. Didn’t get to use his pace on the counter-attack as effectively as Ole was probably hoping for when he introduced Anthony Martial. Romelu Lukaku (13 mins) N/A – Forced a comfortable save from the Leicester goalkeeper with a 20-yard effort in a move that Romelu Lukaku started by winning the ball back inside his own half. Phil Jones (1 min) N/A – Replaced Jesse Lingard as we were on the back foot during the closing minutes.